Upper DolpoTrekking, an adventure to Nepal Far North West Himalaya where foreign travelers hardly visits this awesome country full of ancient Bon culture of pre Buddhism along with present Buddhist religion, leads to the land of elusive snow leopard and blue sheep. Walking into Nepal largest national park called Shey-Poksundo with an area of 3,555 sq.kmswhich extends from eastern Dolpo near Dhaulagiri and Mustang region to further far west at Mugu district as our route leads first to beautiful emerald colored Phoksundo Lake or Ringmo lake close to Ringmovillage enriched with ancient Bon and Buddhist culture and age-old traditions of great interest, with rest to enjoy the views and as for acclimatization. 1 Day 1: Arrival in Kathmandu and transfer to hotels.On reaching Kathmandu Tribhuwan International Airport where you will be warmly received by our guide and staff and then transfer you to your respective hotels in the hub of Kathmandu city. First check into your hotel rooms on getting refreshed from the flight and with Jet-Lag, then join with other members of Upper Dolpo Trekking for briefing, where our expert guides will inform regarding your stay in Nepal, hotels, trekking, local lodge-camping with do’s and don’ts information, evening welcome group dinner in authentic Nepalese restaurants with Folk cultural programs to entertain you during your meals. 2 Day 2: Morning sightseeing tour in Kathmandu afternoon flight to Nepaljung.Morning after breakfast leave the hotel for exciting guided sightseeing around Kathmandu where our city guide will lead you to places of interest, Kathmandu a metropolitan city still retains its ancient heritage and varied ancient culture where you will visit world heritage sites around Kathmandu for half day. After an interesting and wonderful tour of ancient historical and religious sites around Kathmandu, afternoon flight to Nepal Far South West to land at warmer sub-tropical city of Nepalgunj and then transfer to nearby hotel with afternoon free preparation for next day journey to UpperDolpo Trekking. 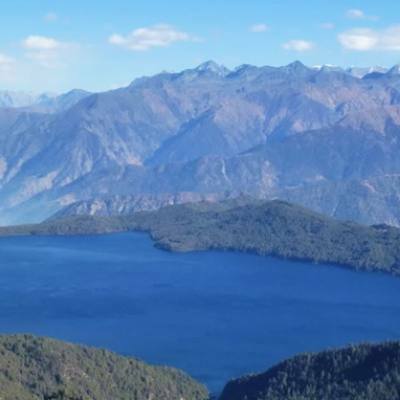 4 Day 4: Trek to Chhepka 2,838 m - 06 hrsOur first day walk starts from Dunai, as morning trek heading past bazaar of Dunaiand then across a bridge aboveThuloBheri River to reach a high ridge above Phuksumdo River valley offers views of Kagmara peaks. After walking on gradual trail, then climb upinto farm villages growing walnut trees within nearDhera a small place of cattle herders, from here leading to a short climb to Rahagaon village of Hindu ThakuriMalla people. From here descend into forest to reach our first overnight stop to camp at Chhepka, a small farm village. 5 Day 5: Trek to Samdua village 2,960m -06 hrs.After Chhepkasituated close to Ankhe village, as morning follows with short climb and then downhillwithin forested area to reach atthe bank of a river, continue uphill walk on leaving forest behind and then descend back into tree lines. From here following upstream of a river to cross a bridge to reachRyajik village, walking little further to reach at Samdua for overnight camp, close to the entrance gate of Shey-Phuksundo National Park. 6 Day 6: Trek to Phoksundo Lake 3,630 m - 06 hours.Morning walk start to reach atPhoksundo Lake after PungmoKhola (stream) on following the stream and then downhill into birch and pineforest reaching upper section of PhoksundoKhola. After a short rest walk leads into Ringmo village, a lovely and interesting Tibetan origin village with similar culture of Buddhism and Bon (pre Buddhist) religion. Housesbuilt with mud plastered including Chhorten and Mani (prayer) walls of Bon sect and Buddhist religion. From here a short walk to Phuksumdo Lake for overnight camp near the bank of turquoise colored Phoksundo Lake. 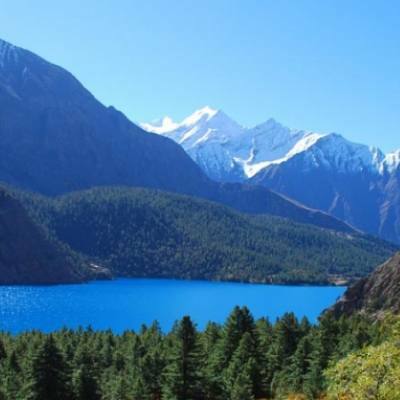 7 Day 7: At Phoksundo Lake rest and explore around Ringmo village and the lake.Enjoy another day at beautiful Phuksumdo Lake, an opportunity to soak in local Dolpo villages around Ringmo of immense culture and custom, where you explore this pristine areas often visited by few other trekkers. 8 Day 8: Trek to Phokshundo-Khola 3,750 m- 05 hrs.After a pleasant and exciting time at Phoksundo Lake also called as Ringmo Lake, our journey continues towardsUpper Dolpoareas, a restricted region where special permits has to be obtained from here onward up to SheyGompa and Saldang villages. Our walkleads to contour around a rocky ridge and ledge past bank of the riverto reach an opens and wide valley atPhuksumdoKhola for overnight camp. 9 Day 9: Trek to PhoksundoBhanjyang 4,717 m - 04 hrs.Morning starts on gradual trail heading north leaving behindPhoksundoKhola with climb toa high hill, after a steep climb reaching top of the ridge facing views of large green valley with Kang-La pass towards north direction to ourmain destination toSheyGompa. Overnight camp ispitched on a nice pasture at the base of high Kang-la pass. 10 Day 10: Cross Kang-La 5,350 m and trek to SheyGompa 4,160 m -06 hrs.Starting much early morning to reach our main destination at SheyGompa, as walk leads to a steep climb on stones and rocky trail then reaching on top Kang-la pass above 5,350 meters and / 17,655 ft the highest spot of the adventure. From the pass enjoy fantasticpanorama of beautiful country landscapes with snow peaks which includes Mt. 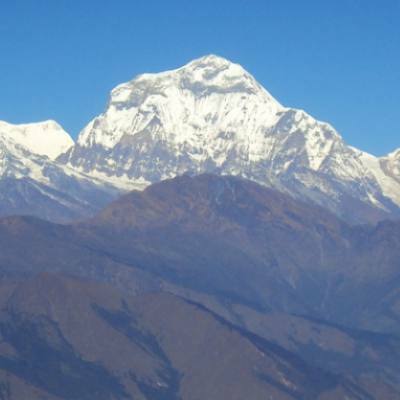 Dhaulagiri towards Far East, after a refreshing break with views descend to reach at the base near a river, then across cattle herder camps towards Buddhist prayer monument and Chhortenor Mani. A pleasant walk reaches you to destination at SheyGompa, situated at the bottom of unique Crystal Mountain considered as sacred Mountain with an old monastery close to the holy peak. 11 Day 11: Rest day at SheyGompa the crystal monastery.A wonderful spot for rest and spare day within isolated area of Far West Himalaya, certainly a hidden place away from civilization blending well with surrounding wilderness ofserene and pristine environment. 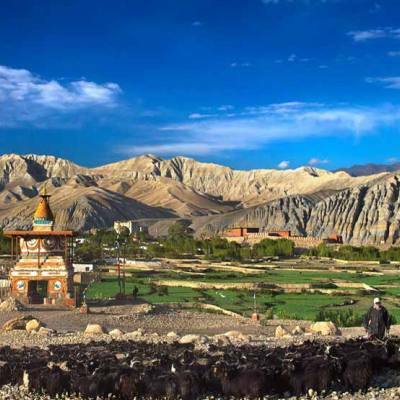 At Shey with ample time to explore around and visit its very old Gompa also known as Crystal Monastery which is well defined in the classic novel ‘Snow Leopard’ by American author Peter Matthiessen. 12 Day 12: Trek to Namgung 4,608 m via Sela (Gela) La 5,094m.From this isolated and lovely spot, our adventure continuestowards a wall canyon, as our path meanders to reach Sela or Gela-la a small ridge top above 5,094 m high, offers views of landscapes with Dhaulagiri mountains. From here descend slowly admiring the scenery then reaching anice grazing area at NamgungGaon for overnight stop. 13 Day 13: Trek to Saldang 3,770 m - 05 hours.After overnight at NamgungGaon, walk on dusty path which leads uphill towards our overnight camp at Saldang, another interesting and a large village of Upper Dolpoarea, placed high above a plateau. 14 Day 14: Trek to Chagaon 4,910 m - 05 hrs.From Saldang, morning trek leads to Nang Chu River and then following the river all the way with few ups and down walks pastSugu-Gaon and DechenLapran, a cattle herders place and then trekking to our overnight camp at Chagoan village. A small pleasant village with an old monastery called Rapa Gompa of Bon sect, a pre Buddhist religion and ancient Bon-Pa culture. 15 Day 15: Trek to DachuKhola camp at 4,700 m - 06 hrs.Morning leads south intoTarap valley on routeToku and DhoTarap villages, walk leads to reach at DachuKhola and beyond, after crossing on the same trail following a river through farm fields, and then walk into Yak herder areas for overnight camp. 16 Day 16: Trek and cross Jyanta-La at 5,220 m and walk to Phedi4,900 m - 06 hrs.After nice stop around summer pasture of Yaks grazing area, morning walk following river for short while, and then coming across yaks and mules laden caravan on route Tibet that still exists since past glorious times. Walk on route which is near an old Trans Himalayan Salt Trade route of Nepal and Tibet, which is close from the base of Jyanta-la pass, as morning walk leads to a climb on top of high pass offering views of Mt. Dhaulagiri peaks, and then a long descend takes youatthe base of the pass for overnight camp. 17 Day 17: Trek to TokuGaon 4,209 m via Jeng la 5,090m-06 hrs.Morning heading for steep climb, and then walking on gradual winding path for some hours to reach a charming village ofTokuGaon for overnight stop, one of the most attractive villagewithin InnerDolporegion, which consists more than ten group of villages within the valley and with nice tended farm fields including an old interesting monasteries. 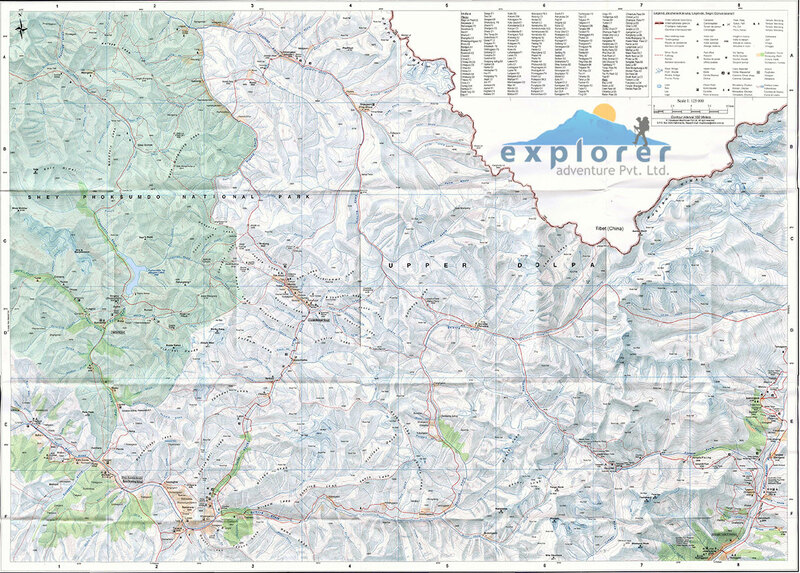 18 Day 18: Trek to Dhotarap 3, 944 m- 05 hrs.AfterTokuGaon, morning walks starts with downhill towards Tarap Chu (river)and then entering a wide scenic valley, where many yak herder temporary settlements located. Walk continues to Dhotarap overnight camp close to a village inhabited by mixed tribe of Tibetans origin as well Magar people. 19 Day 19: Trek to Ghyamgar 3,759 m - 07 hrs.From this nice campsite, walk continues with a downhill towardsTarap valley, largest and longest valley of Dolporegion extends to near 20 k.m. long, following Tarap Chu River to joins withThuliBheri River near Tarakot village. Our journey leads past Langawith views of lovely cascading waterfalls and then walking due south following our route to Sisaul and f Kesila around Yak herder camps to reach our overnight camp at Ghyamgar. 20 Day 20: Trek to TarapKhola 3,652 via Chhyugar 3,440 m - 06 hours.Morning walks leads at Tarap areas within magnificent valley and then entering a narrow gorge covered with bushes of juniper and wild rose, walking past Toltol near to a huge overhanging cave, around this place chance of spotting some wild life like Naur or Blue Sheep and other animals including endangered Snow Leopard as well. As walk proceeds reaching at the confluence of Tarap Chu and Lang Khola (streams), overnight camp is set close to a river after a good and exciting walks of six hours. 21 Day 21: Trek to Tarakot 2,540 m - 06 hrs.Slowly our journey comes to an ends as walk leads towards Tarakot village past several smaller farm villages to enter small woodland along the bank of a river and then reachingat Tarakot, one of the large and interesting village with ancient historical background. Tarakot a village with an forts known as Dzong in Tibetan, and in Nepali known as Kot placed to guard the entrance of the village from outside world. Tarakotwith famous and old SandulGomba,located on the junction of BarbungKhola and Tarap Chu River where our overnight camp is made. 22 Day 22: Trek to Dunai and drive back to Jhupal - 04 hrs.After a pleasant overnight at Tarakot our last day walk of the adventure leads to near Dunai, and then taking an exciting drive to reach our final end of the journey at Jhupalon reaching Dunai the major town of Dolpo, where drive leads to our final overnight stop at Jhupal on completing Upper Dolpo trekking before heading back to Kathmandu. 23 Day 23: Fly to Kathmandu via Nepalgunj.Morning transfer to small Jhupal airstrip for the flight to Nepalgunj, after boarding in small aircraft where short flight brings you at Nepalgunj for connecting flight of 50 minutes to reach back at Kathmandu. On reachingat Kathmandu airport, thentransfer to your hotel with rest of the day at leisure with grand memories of Upper Dolpo trekking. 24 Day 24: Spare and free day in Kathmandu for individual activities.Reserved this spare day in Kathmandu as contingency in case of flight delay and cancellation at Jhupal in Dolpo, which can happen sometimes due to bad unfavorable weather conditions if all go well according to our itinerary days, enjoy the day with individual activities and shopping. 25 Day 25: Depart for international flight home ward bound or to respective countries.Your last memorable day in Nepal after a wonderful experience and adventure on Upper Dolpo Trekking with great service of Explorer Adventure, and as per your international flight then transfer to Kathmandu international airport for homeward bound or to your respective destinations. Domestic flights fare as per the itinerary from Kathmand-Nepalhunj-Jufal-Nepalgunj-Kathmandu. Highest elevation gain: At Kang-la 5,350 m&Jyanta;-La at 5,244 m high. Hours of Walks : From minimum 4 to maximum 6 hrs.